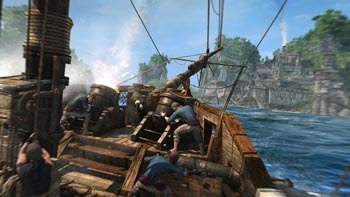 Ubisoft: "It's Not True That We Don't Care About PC Optimization"
Assassin's Creed 4: Black Flag associate producer says the PC is an important platform for Ubisoft. There's an opinion out there that Ubisoft doesn't care about the PC ports of its games, evidenced by "poor optimization" of some of its titles. However, Assassin's Creed 4: Black Flag associate producer Sylvain Trottier says this simply isn't true, and the PC is an important platform for the company. "It's absolutely not true that we don't care about PC optimization," Trottier said in a blog post. "If we didn't care about PC optimization, then we would not have such a big team dedicated just to the PC version in Kiev." "We are very proud of the PC version of Black Flag: the game runs well on low-end PCs, and lots of additional features were added for higher-end machines, allowing each and every customer to fully enjoy the experience on their PCs. Our partnership with Nvidia that saw our respective engineering teams work together to develop a highly optimized PC version also demonstrates our commitment to the platform." "If you can see our game run at 4k resolution on PC, it's magical. It's beautiful," he added. Trottier explained that when it comes time to optimize a game for all of its platforms, the PC is the one that they start with, not only for logistical reasons, but but because it was also the environment the engineers are most familiar with (especially in the early days of this next-generation of consoles). He also praised the PS4 and Xbox One's decision to use a more PC-like architecture this time around, as his team can apply PC optimization techniques to the consoles. "If, say, the team finds a way to shave 50% off the GPU burden for a particular effect, they can then expect a roughly equivalent savings on both next-gen consoles, and they can be confident in their ability to apply those savings."